In coming years, the global economy is going to need all the help that it can get. All countries of the West face a severe demographic challenge from the twin effect of an aging population and a large inflow of foreign migrants. Technology and innovation will continue to be powerful drivers of the economy but they will only partially offset the sluggish aggregate demand seen in richer countries. Fortunately, there are very large untapped reserves of economic strength and they are mainly in the populations of Africa and South and Southeast Asia. In many of these countries, productivity is so low, education so rudimentary, infrastructure so poor that investments sustained over a long period should yield outsized returns. Although its economy has decelerated, China in the past three decades has shown a road map to fast development that could be used by other emerging countries. Based on the Chinese model, the combination of rising literacy and declining fertility can create a powerful dynamic that in the context of stable institutions and increased investments can result in a substantial demographic dividend. In the next thirty-five years to 2050, many African and Asian countries will have a historic window of opportunity to progress along the same path. 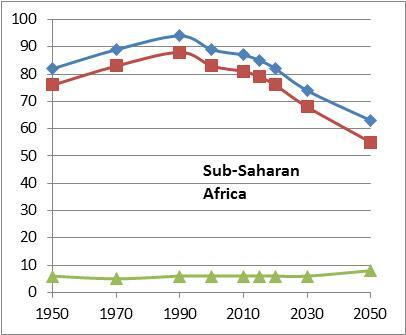 As seen in the chart below showing all sub-Saharan countries, increased female literacy coincides with lower fertility, with the biggest change occurring when literacy rises over 80%. GDP per capita is low or extremely low in countries where the population is very young. But as fertility drops, the percent of young people also drops, freeing up resources to increase productivity. At a certain point, GDP per capita starts to rise and continues to rise for a long time. As shown in the next chart, the poorest countries in the world are also the youngest. In fifty-one countries, the under-30 segment adds up to 65% or more of the population. In thirty-one of them, it exceeds 70%. Nearly all of them are in Asia and Africa. In theory, a decline to say 60% could result in a significant rise of GDP per capita, all other things being equal. Using our analysis of the relation of fertility and national income, our estimates of GDP gains are shown in the tables below if the share of the under-30 falls to 65%, 60%, 55% or 50% of total population. 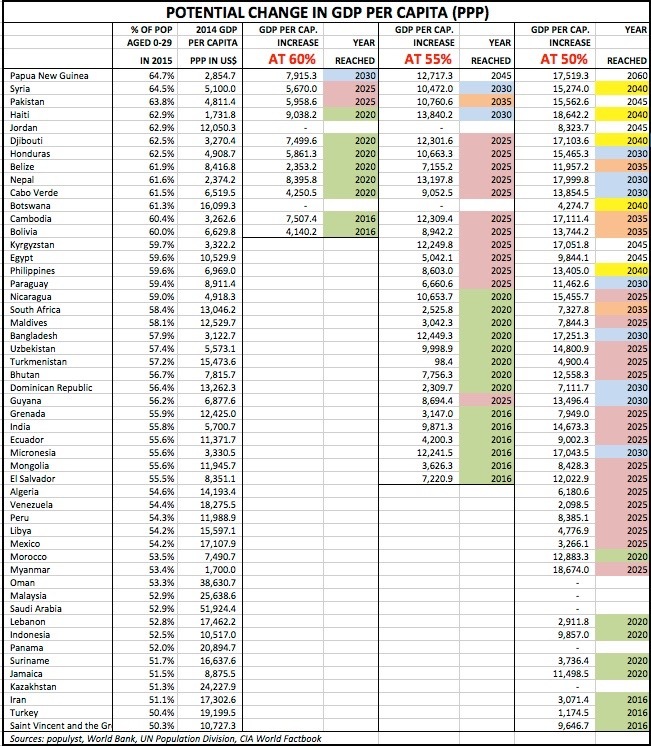 We also include the years that each country will attain these ratios, using the UN’s medium variant projections. Milestones that occur within the next 25 years are shown in color, with a different color for every five year group (green for 2020, blue for 2030 etc.). For example, in Kenya the population aged less than 3o will decline from 70% of total in 2015 to 60% in 2040, in theory creating an opportunity for a big jump in GDP. In the case of Kenya and of sub-Saharan Africa in general, this opportunity is well supported by the fact that overall dependency ratios (DR) will decline for several decades. Shown in the graph are the total DR in blue, child DR in red and old-age DR in green. Several central and south American countries look good in the table, as they will reach demographic milestones by 2020, for example, Nicaragua, Belize, the Dominican Republic, Honduras, Ecuador etc. Clearly, the GDP increases shown in the table cannot be seen as reliable forecasts. Many other factors come into play beside demographics. 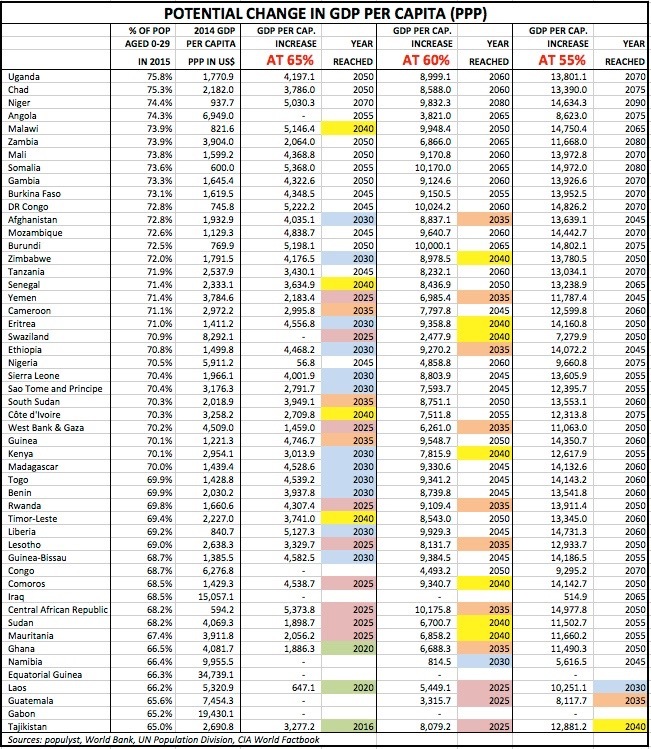 But this analysis highlights the directionality of the demographic input. As the percentage of young people declines, an opportunity opens up to effect large improvements in GDP. An economic dividend is not an automatic result of improving demographics. It is usually achieved through simultanous investments in productivity and improvements in governance. At the very least however, it would be surprising if a very young country grew older without improving its economy. If the potential change in GDP per capita is very large in the near years, that would be an indication that an economy was operating in 2014 well below its potential. An example of this is Myanmar, a country that experienced some turmoil in recent years but that may now be on the path for big economic gains. By contrast, Turkey in 2014 was operating close to the its economic potential, at least as suggested by its demographic profile. The tables above are based on the United Nations median variant. 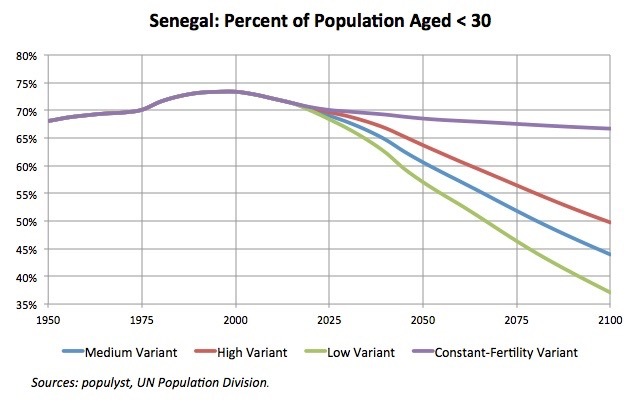 The UN’s Population Division also produces other variants which show no change in the fertility rate (constant-fertility), a slower decline (high variant) and an accelerated decline (low variant). The consequences of each scenario on future GDP can be quite large especially in the out years. 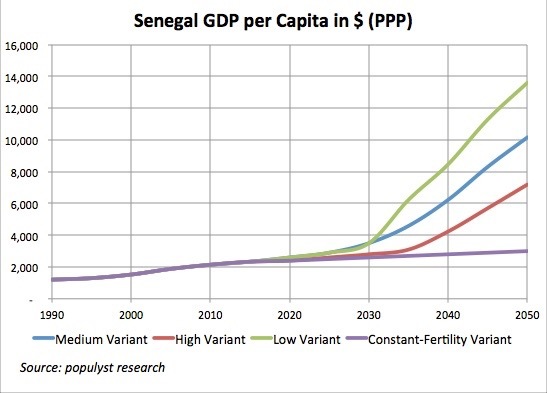 Using the same approach with Senegal as an example (randomly chosen), we show in the charts below the country’s young population and future GDP per capita based on each fertility scenario. Looking at 2040 for example, we see that GDP per capita is relatively unchanged under the constant-fertility variant, but that it rises to $4,200, $6,200, and $8,500 under the high, median and low variants. Though it may not be reliable in a precise way, this analysis seems directionally correct. Our interest in these outcomes is not merely academic. On one hand, it is right to highlight the steps that may lead to greater prosperity in poor countries. And on the other hand, the West faces its own economic challenges and the global economy needs new sources of growth in all developing parts of the world, in Latin America, Africa and Asia. ← Would Reaganomics Work Today?